CytoSpec data files contain spectral hypercube data which include the original spectra and up to three 3D data blocks of processed data, and the corresponding metadata. Such files can be stored, or loaded by choosing the 'load', or 'save' functions of the 'File' menu bar. When selected, a standard Windows dialog box comes up which allows browsing the directory structure and selecting appropriate data files. Data are stored with single precision (float32) while all calculations are carried out with double-precision floating-point values (float64) numbers. Please note: The default file name extension of binary CytoSpec workspace files is '*.cyt'. File with extensions '.dis', '.cls', or '.pca' contain results of hierarchical cluster analysis (HCA), or principal component analysis (PCA) and are of different format. These files cannot be loaded by using the 'load' function. Please note also that data files created with CytoSpec version 1.05.09, or earlier, cannot be loaded anymore. Please use the 'import' option to use these data. This option permits to save the spectral hypercube in a format that is compatible with Matlab (The Mathworks Inc., Natick, MA). Select 'save Matlab' from the 'File' menu bar. A standard Windows file dialog box will appear. Use the dialog box to find a logical location on your disk and enter a filename (e.g. 'fname') with '.mat' as the file extension. Open Matlab and cd to the directory where the stored file resides and type '>> load fname' at the Matlab shell. This will cause Matlab to open the file. As a result a 4D array 'C' (double precision) will be available - C contains the spectral hypercubes. 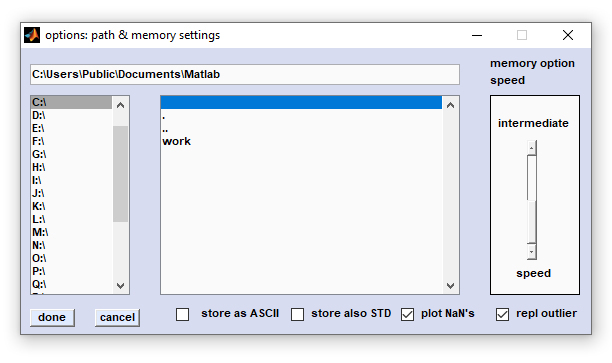 Furthermore, the Matlab workspace comprises a structure array 'Minfo' with a number of structure and character arrays containig metadata information. The array 'C' will have the following dimensions: xdim × ydim × zdim × data block number, where xdim denotes the number of pixel spectra in x-direction, ydim the number of pixel spectra in y-direction and zdim the number of spectral points. Data block #1 denotes the block with the original hyperspectral image data, block #2: preprocessed data; block #3: derivative data; block #4: (de)convolution data, for details see also the chapter Internal Data Organization. Minfo.File: A structure array with fields (char arrays) such as 'Minfo.File.INS', 'Minfo.File.MAN', Minfo.File. 'SRC', etc.). These char arrays contain important data acquisition parameters and are required for all types of spectral analyses. A detailled description of these parameters can be found in the chapter Edit Parameters of the CytoSpec online manual. IMPORTANT: Note that CytoSpec is strictly designed for hyperspectral imaging. The program cannot handle single point spectra. Importing point spectra won't work! This function can be used to import single column ASCII data from hyperspectral imaging measurements of rectangular sample areas with an equal point spacing in x- and y-direction. The routine assumes furthermore an equidistant point spacing in the spectral dimension with all spectra vectors being of the same length. Missing spectra and/or missing absorbance / intensity values will cause abnormal termination of the ASCII import routine. Data format: Single column ASCII data are one-column vectors of absorbance/transmittance/Raman intensity data (see example below) from high to low wavenumbers, or frequencies. The user is prompted to enter the high (upper limit) and low (lower limit) wavenumber or frequency values. 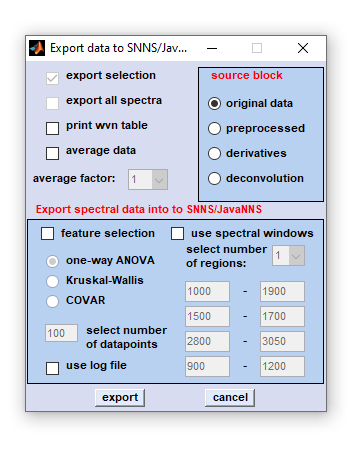 During data file loading, the program will automatically determine the wavenumber step increment (wvs) and the number of spectra data points wheras the spatial position of the spectra vectors is determined from the file names, or from the numeric file extension (see below for details). Edit fields xdim and ydim: [x,y] spatial dimensions of the hyperspectral image to be imported (in pixels). The CytoSpec testdata directory (see directory ...\CytoSpec\CytoSpec\Testdata\ASCII\y) contains an example of single column ASCII data with xdim × xydim = 11 × 16 (→ 176 spectra). In order to import the complete hyperspectral image, all ASCII files must reside in one directory. Please make sure that all ASCII files are of equal length, i.e. contain the same number of lines . Edit fields with the wavenumber range (upper / lower wvn limit): Please indicate the highest (upper limit) and the lowest (lower limit) values. Note that CytoSpec assumes a equidistant point spacing in the spectral dimension. Increment extension: The checkbox marked 'increment extension' determines if the spectra [x,y] positions are taken from extensions or file names. One can either import single column ASCII data incremented by file extension (e.g. spec.0, spec.1 ... spec.999) or files in which a numeric part of the filename is incremented (for example spec0001.0, spec0002.0, spec0003.0, ..... , spec9999.0). 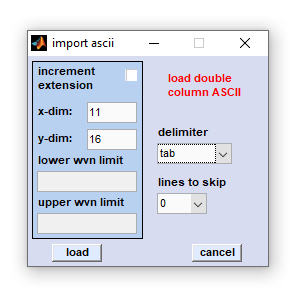 Check the 'increment extension' checkbox to load ASCII files incremented by their extension. Otherwise it is assumned that the spatial position is encoded by filenames (allows loading of 10.000 single spectra max, otherwise of 1000 spectra). After pressing the 'load' button, a standard file window will appear, in which you may browse the directory structure of your computer or network connections. Select then the first ASCII data file and press the 'load' button. A progress indicator will show the progress of loading files. In case of problems please try first to import ASCII data of the ...\CytoSpec\CytoSpec\Testdata\ASCII\y directory. Contact only then the CytoSpec support. This function can be used to import double column ASCII data from hyperspectral imaging measurements of rectangular sample areas with an equal point spacing in x- and y-direction. The routine assumes furthermore that all spectra vectors are of the same length. Missing spectra and/or missing frequency / absorbance / intensity values will cause abnormal termination of the ASCII import routine. Data format: Double column ASCII data represent two column vectors of wavenumber / frequency data and absorbance/transmittance/Raman intensity data, respectively (see example below) from high to low wavenumbers, or frequencies. Allowed delimiters between the first and the second column data are komma [,], space [ ], tab [	] and semicolon [;]. During data file loading, the program will automatically determine the spatial position of the spectra, either from the ASCII file names, or from the numeric file extension (see below for details).
. . . . . . . . . , . . . . . . . . .
Edit fields xdim and ydim: [x,y] spatial dimensions of the hyperspectral image to be imported (in pixels). The CytoSpec testdata directory (see directory ...\CytoSpec\CytoSpec\Testdata\ASCII\xy) contains an example of double column ASCII data with xdim × xydim = 11 × 16 (→ 176 spectra). In order to import the complete hyperspectral image, all ASCII files must reside in one directory. Please make sure that all ASCII files are of equal length, i.e. contain the same number of lines . Delimiter: the following delimiters are allowed: komma, space, tab, and semicolon. Lines to skip: ASCII data files may contain header lines with some text information which cannot be analyzed by CytoSpec program. To avoid errors during loading please indicate the number of lines, which should be skipped by the double column ASCII import routine. After pressing the 'load' button, a standard file window will appear, in which you may browse the directory structure of your computer or network connections. Select then the first ASCII data file and press the 'load' button. A progress indicator will show the progress of loading files. In case of problems please try first to import ASCII data of the ...\CytoSpec\CytoSpec\Testdata\ASCII\xy directory. Contact only then the CytoSpec support. This option permits loading ASCII data from hyperspectral imaging experiments. The example below illustrates the expected format of a xyz-1 ASCII file (4 x 4 spectra). Second line: intensity / absorbance / transmittance values of the spectrum at position [x(1),y(1)]. To import ASCII xyz-1 data select 'import ASCII' → 'xyz-1 ASCII' from the 'File' menu bar. A standard file window will appear which allows browsing the directory structures of your computer or network connections. Select then the xyz-1 ASCII data file and press the 'load' button. In case of problems try first to import one of example files (xyz-1.txt or xyz-1d.txt) from the testdata directory (C:\Program files(x86)\CytoSpec\CytoSpecRoot\Testdata\ASCII\xyz\) before contacting CytoSpec support. The example below illustrates the expected format of a xyz-2 ASCII data file. xyz-2 ASCII files contain four columns. To import xyz-2 ASCII data select 'import ASCII' → 'xyz-2 ASCII' from the 'File' menu bar. A standard file window will appear which allows browsing the directory structures of your computer or network connections. Select then the xyz-2 ASCII data file and press the 'load' button. In case of problems try first to import the example files (xyz-2.txt) from the testdata directory (C:\Program files(x86)\CytoSpec\CytoSpecRoot\Testdata\ASCII\xyz\) before contacting CytoSpec support. The example below illustrates the expected format of a xyz-3 ASCII data file. xyz-3 ASCII files contain 'zdim+1' lines with zdim being the number of wavenumber points. First line: The string Wavenumber followed by the [x,y] pixel coordinate indicator in the format xabc_ydef. To import xyz-3 ASCII data select 'import ASCII' → 'xyz-3 ASCII' from the 'File' menu bar. A standard file window will appear which allows browsing the directory structures of your computer or network connections. Select then the xyz-3 ASCII data file and press the 'load' button. CytoSpec offers importing hyperspectral data in various formats, among them a number of manufacturer-specific formats. (Digilab®) Hyperspectral imaging data (*.dat) files acquired with the Resolutions Pro software from Agilent®, former Varian®, former Digilab®, or BioRad®) can be loaded in the native format. Please note that the *.dat and the *.bsp file (same file name!) must reside in the same directory. (Mosaic files) CytoSpec's import filter for mosaic files acquired with Agilent's Resolutions Pro software. Please note that the *.dmt file and the complete series of mosaic tiles (*.dmd files) must reside in one directory. Please do not change files names. The root file name must not be modified! AFMIR AFMIR data files. Import filter for AFMIR data. (Grams 3D) Galactic Grams32, now Alfasoft, hyperspectral Grams 3D multifiles (*.spc). No problems have been reported so far. CytoSpec offers import of Bruker OPUS multifiles. The filter allows importing OPUS-3D data files, including mapping and FPA data. CytoSpec The import filter for hyperspectral data in the CytoSpec data format. Horiba Jobin-Yvon® The import filter for Horiba Jobin-Yvon ASCII (xyz) data files. This filter requires conversion into an ASCII data format by the data acquisition software. Hyperspectral data can be also imported via Alfsasoft's® spc data format. This requires conversion of Raman hyperspectral images into the spc data format. Kaiser® Kaiser Raman Holospec data files. Import filter for Kaiser Raman Holospec data files. Requires conversion into an ASCII data format. Matlab® The import filter for hyperspectral images in a Matlab compatible data format. Details of this file format can be found in CytoSpec's online documentation for the Matlab file format. NT-MDT® NT-MDT data files. The CytoSpec import filter for NT-MDT multispectra (Matlab script files). PerkinElmer® The filter allows loading hyperspectral data collected with PerkinElmer's SpectrumSpotlight IR data collection software. No problems reported so far. (WiRE 4.0) Import filter for Renishaw WiRE *.wdf spectral hyperspectral data files. With version 2.00.02 CytoSpec supports importing of WiRE 4.0 *.wdf mapping data files in Renishaw's native data file format. 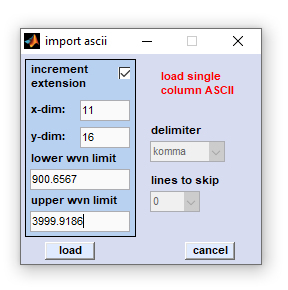 (ASCII) Import filter for Renishaw WiRE *.txt Raman data files (ASCII data format). Renishaw 3D data files can be also imported by CytoSpec via Alfasoft's® spc data data format. Requires conversion of Raman hyperspectral images into	the spc data format. When loading spc data you may have to enter the values for xdim and ydim (number of pixel spectra in x- and y-direction). This information is sometimes not contained in the converted spc data files. (Nicolet) Thermo Atlus (former Nicolet®) *.map data files. Updated (CytoSpec v. 2.00.01) import filter for Atlus version 7 mapping data files. (Thermo/Raman) Import routine for Thermo/Raman data files acquired by OMNICxi Raman imaging software for the DXR®xi Raman Imaging Microscope . CytoSpec allows importing of Raman maps stored in the HDF5 data format (*.h5, hdf5 libraries version 1.6.4). Note that the *.h5 import filter is supported only by CytoSpec's 64-bit toolbox (CytoSpec 64-bit stand-alone, or Matlab pcode toolbox). v.2.10 Import filter for WITec confocal Raman microspectrometer data produced by the WITec Project software 2.10. Requires conversion into an ASCII, or spc data format. See this description for details). Project Four Import filter for WITec confocal Raman microspectrometer data produced by the WITec Project Four software. Requires conversion into a Matlab format. Project Four data files can be also imported via the ASCII, or spec format. In these cases refer to the decription of the WITec®v.2.10 import filters (see above). Note that some import filters are still in an experimental stage and may be based on incomplete information of the internal file structures. Bug free operation of these filters cannot be guaranteed! Import filters were tested using data of the directory 'C:\program files(x64)\CytoSpec\CytoSpec\Testdata' on the program USB stick or CD. Testdata are also available form the CytoSpec website, see here (download binary and ASCII test data) for details. In case case of problems try first to import / load the test data and only then contact the CytoSpec support (support@cytospec.com). GA_ORS: Genetic Algorithm - Optimal Region Selection, a command line based UNIX/LINUX tool for analysis of IR, Raman and MRI data (optimization, feature selection). csv format: spectra are stored as comma separated values in one ASCII file. The first column contains the spectral vector of wavelength, wavenumber, or Raman shift values. x,y-ASCII text files: simple export function for spectra export to applications software such as OPUS ( Bruker Optics), Grams/AI ( Alfasoft®), Microsoft Excel, or Origin ( OriginLab). JCAMP-dx: export of spectral data files into the JCAMP-dx data format. Galactic spc: spectra are exported as single files via the spc data format. export selection: Check this checkbox to export a selection of spectra. If unchecked complete hyperspectral images are exported. Details of how to select spectra for export are given below). export all spectra: a complete 3D spectral data block will be exported. Note that this option is available only in combination with the options export plain ASCII' or 'export JCAMP-dx' data files. To export complete hyperspectral maps into a format compatible with SNNS, GA_ORS or TOOLDIAG select the 'use log file' option. print wvn table: a file 'wvn_conversion_table.dat' is created. This file contains the wavenumber positions of the spectral features. average data: to lower the computational efforts the data point spacing can be increased by averaging in the spectral domain. Please select an average factor. average factor: this factor indicates the degree of reduction of the spectral resolution. source block: please choose one of the four data blocks: original, pre-processed, derivative, or (de)convolution data. feature selection: if activated, you can select between the options ANOVA, COVAR and PCA. Please indicate also the number of data points, that is the number of the best discriminative spectral features. According to the feature selection criterion, only the best n features are exported. Note that only the feature selection option ANOVA has been implemented yet. use spectral windows: permits selecting distinct spectral windows. number of spectral windows: please indicate the number of spectral windows. use log file: a log file from a previous CytoSpec export session can be loaded. This function is required for creating external validation hyperspectral image image tests sets. When this option is chosen the settings for feature selection and spectral window selection of a previous CytoSpec export session are loaded and utilized. IMPORTANT: after loading the log file, the checkbox 'export all spectra' which is usually inactivated becomes activated. In this way it is possible to export complete hyperspectral images for external validation (classification) purposes to applications like the SNNS, or ga_ors. export: press this button to open a standard Windows file browser. Choose an appropriate file name and the target directory. Either a complete hyperspectral image, or a selection of point spectra can be exported. The following section describes the procedure of selecting and assigning [x,y] point spectra to classes, or spectra categories. 1. The context menu shown in the screenshot to the left can be obtained by a mouse click (right button). 2. To assign point spectra to class 1 choose 'class 1' → and 'add/start'. This activates the 'select spectra' mode. In this mode, the mouse cursor changes the appearance (arrow plus cross). 3. Select now an unlimited number of spectra by left mouse clicks. Please note that spectra are not displayed in this mode. 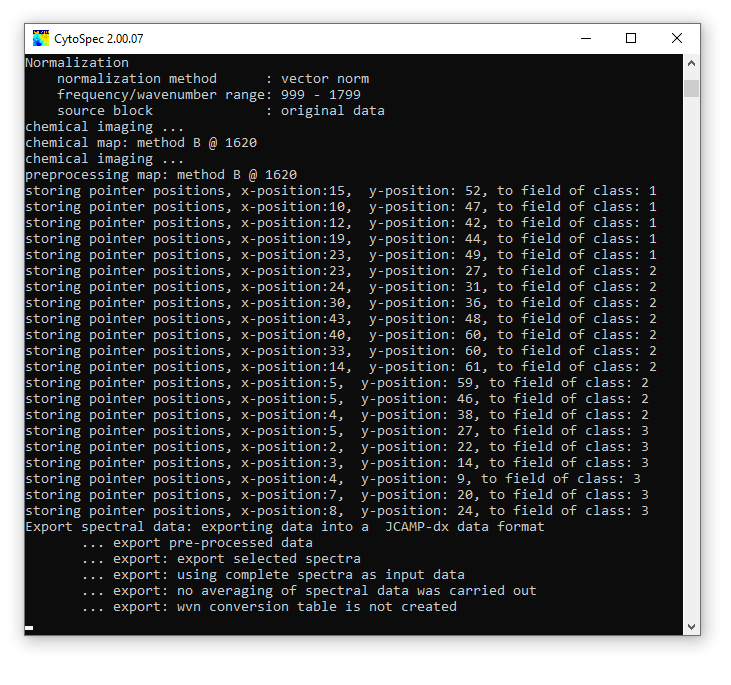 The spatial coordinates will be indicated in the report (command line) window, see below. 4. To assign spectra to another class select 'class X' → and 'add/start'. Add then point spectra as it is described above. 5. If all spectra are selected, stop the selection mode by choosing 'selection mode off' from the context menu. CytoSpec returns to the standard mode 'show spectra' and the mouse pointer will regain its normal appearance. You can now call the 'export' function and export selected spectra. Delete selections / delete class assignments: Deleting class assignments can be carried out either for a class of choice by selecting 'class X' → and 'delete' (see screenshot to the left); or for all classes by selecting 'delete class assignments' from the context menu. Show class assignments: To display class assignments for an individual class of spectra select the 'class X' → and 'show' function. Alternatively, one can also use the 'show class assignments' function from the context menu. The screen output of the 'show class assignments' function is exemplary illustrated in a screenshot of the CytoSpec report window (see below). functions which were executed consecutively. A detailled description of CytoSpec's internal data organization can be found here . This function clears the existing workspace by removing all existing hyperspectral image data. All existing data are lost if not stored before. The 'clear'-function may be useful to free memory before performing memory-consuming calculations such as hierarchical clustering (HCA). This function allows plotting CytoSpec's main window as an eps (encapsulated postscript) file. Eps graphic files can be import by vector graphic software like CorelDraw. Use the capture function for storing pseudo-color images in a bitmap (bmp) image format: To store the zdata information - the data used to generate the speudo-color images - in an ASCII data format use the export maps function of the 'Tools' menu bar. Furthermore, screenshots of CytoSpec's main window can be obtained by the capture function of the 'Tools' menu bar. Memory management modes: CytoSpec offers two distinct memory management modes. This functionality was introduced to allow highly memory consuming operations also with limited RAM resources. With version 2.00.01 and the availability of the 64-bit version of CytoSpec the memory mode 'compress' is obsolete and has been removed. 'intermediate' - relatively fast, but less memory consuming. Try this option when datasets are large and/or the amount of installed RAM is low. Spectral data are stored with 4 byte precision as float32 values on disk. Only the required data block will be stored in memory (RAM). When performing HCA, the distance matrix is stored in RAM. 'compression' - this memory option has been removed with version 2.00.01 (see 64-bit version of CytoSpec for details). Plot NaN's: NaN spectra, also called 'bad pixel spectra', are produced by the quality test and some other routines: If the quality test of a given spectrum is negative, the respective spectrum in the data block of preprocessed data will be replaced by NaN (Not a Number) values. The checkbox 'plot NaN's' defines the way how NaN pixel spectra are handled when constructing pseudo-color images containing NaN spectra. If this checkbox is not active (unchecked) NaN spectra will be plotted as black squares. Note that in such cases the size of the square may be larger than the original pixel area, which is due to fact that pseudo-color images are usually created by certain interpolation. If the checkbox is checked, NaN pixel values will be replaced by	some numeric values beyond the lower data limit. These pixel values are then mapped to the color used to represent the minimum values of false color images (e.g. blue in case of the standard colormap 'jet'). Store as ASCII: This checkbox defines the format used to store average spectra produced by multivariate imaging functions like hierarchical clustering (HCA), k-means clustering (KMC) and others, endmember spectra obtained by vertex component analysis (VCA) or n-findr, or the format of mean spectra defined by the region of interest (ROI) tool. If the checkbox 'store as ASCII' is checked, spectra will be stored as double column ASCII files (first column: frequency or wavenumber values, second column: intensity/absorbance/transmittance data, separator: space). Otherwise, spectra are stored in a binary data format (*.spc). Store also STD: Allows to store also standard deviation spectra when using the 'save mean spectra' routines of multivariate imaging functions like HCA or KMC imaging, or the ROI tool (see above). Check this checkbox to save mean and std spectra when storing cluster mean spectra, or mean spectra from ROIs. Batch multiple files. CytoSpec versions 1.2.02 and later permit automatically batch-processing hyperspectral image data. The 'batch multiple files' function is based on the batch preprocessing routine and requires a predefined macro file (*.cbt -CytoSpec batch) that is fully functional. Before starting the 'batch multiple files' routine it is strongly recommended to carefully check the 'batch preprocessing' function for errors. First, it is required to create a text file which contains path and file name of the batch preprocessing file (first line) followed by paths and file names of the spectral multifiles to be processed (next lines). An example of such a batch file is given here . The batch file should have the extension '*.fnm'. 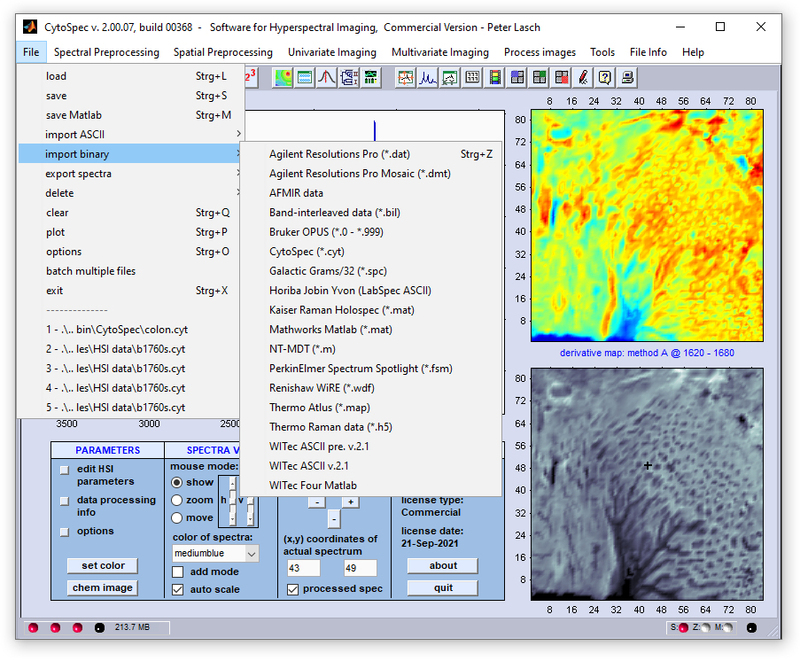 The 'batch multiple file' function can be used to import and pre-process hyperspectral images of various origins. Supported file formats are Matlab (*.mat), Agilent (former Varian, Digilab, or Biorad) Resolutions Pro (*.dat), Bruker OPUS (*.0), Thermo OMNIC (former Nicolet) (*.map), Grams/32 (*.spc), PerkinElmer (*.fsm) and CytoSpec (*.cyt). Spectral data are processed as defined by the batch file order and are stored after processing in the directory where the original data file resides. For storing CytoSpec's data format will be used. The file name will constructed from the original file name with the extension '_b.cyt' added. It is not possible to batch-process multivariate imaging functions such as agglomerative hierarchical clustering. Exit: Closes all windows and performs a shutdown of the program. Data not stored are lost.